Opposition head MK Yitzhak Herzog, chairman of the leftist Zionist Union party, slammed the government on Sunday for its inaction in light of the public and growing threat of Hamas terror tunnels meant to allow attacks from within sovereign Israeli territory. Around 30 of the tunnels were destroyed in 2014 Operation Protective Edge when the tunnels were unveiled to full deadly effect, but Hamas swiftly began rebuilding immediately after the ceasefire, and currently more than one of its tunnels has already crossed underneath the border with more as yet unknown tunnels estimated to be well in the works. Speaking to regional council heads on Sunday, Herzog slammed the conduct of the government in light of recent reports on the renewal of Hamas tunnel digging. "What are they waiting for? For terrorists with weapons drawn to come into a kibbutz or moshav? The Prime Minister and Defense Minister owe the civilians an answer," said Herzog. "They need to order the IDF to blow up the tunnels and to eliminate this threat. Especially if there are tunnels that already have passed under Israel's borders. Hamas is bragging and we are doing nothing, we will wake up one day and discover that we again underestimated the severity of the threat. It will cost us in blood and awful sadness," he added. Illustrating the intensity of Hamas's terror tunnel activity, just last Tuesday seven Hamas terrorists died in a tunnel collapse during the digging work. On Saturday the terrorist group published a video threatening to renew the attack tunnels into Israeli territory, as part of a recent campaign titled "Rijal al-Anfak," or "People of the Tunnels," reports Walla. Hamas presented Gazans with the video trying to justify its great investment in the tunnels as it siphons off of internationally donated building materials to construct them. 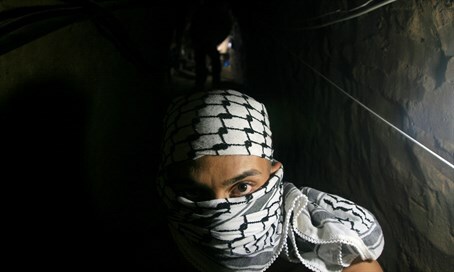 It has presented a number of images of Hamas terrorists decked out with helmets and full military gear in the depths of the tunnels, as well as an illustration showing children playing on grass while under them underground Hamas terrorists lurk in the tunnels, with the caption: "for your lives - we went through the path of death."